I picked up 2 cabs last night from a guy who sold me a Ridge Racer 2 a couple of weeks ago. I got a Surf Planet that needs a cap kit and a dual vs.golf cocktail or whatever you call it cab. The vs. golf has the chip so one side is male golers and the other side is female golfers. It's missing the coin doors, but runs beautifully. Mr borther is buying the Surf Planet from me because it has a metal cp that looks like it was for a Gauntlet type game. 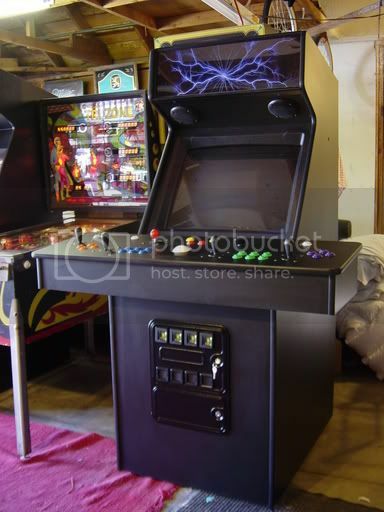 They guy has a Tetris that was in one of those cabs where the monitor is suspended above the body. I didn't pick that one up because I had no room in my pick up. Here's the Ridge Racer 2 with a new coat of black enamel. that surf planet is in a rampage cabinet. i have always wanted one of those vs cocktails but never had one. i do have a regular vs machine though. Hey! I hadn't realized those VS tables supported 4 players! Cool! hows that monitor mounted ? is it 1 or 2 monitors? It isn't really a 4 player game. It's 2 2-player games in 1 cab. I will try and post pics of the insides in a few days. It's being stored at my brother apartment until I can find a way to break the news to my wife without her ripping my nads off. It has a monitor on each side of the tent. Doesn't VS Tennis support 2 vs 2? I love those Vs. cocktail tables! That cocktail reminds me of R2D2 for some reason.